"This is just the base for a basic pepperoni pizza roll. I made this with leftover pizza toppings. I didn't feel like making any dough so I substituted egg roll wraps." Heat oil in a deep-fryer or large saucepan to 300 degrees F (150 degrees C). Whisk egg and water together in a small bowl. Combine the pizza sauce and pepperoni in a blender or food processor. Process until pepperoni is well chopped and the sauce has thickened. Transfer sauce to a large bowl, and stir in mozzarella. Lay out one eggroll wrapper on work surface. Place 1 tablespoon filling at the bottom center of the wrapper, leaving 1/2 inch border on each side. Lightly brush the wrapper edges with the egg mixture. Fold over both sides; roll up to encase filling in wrapper. Repeat with remaining wrappers and filling. 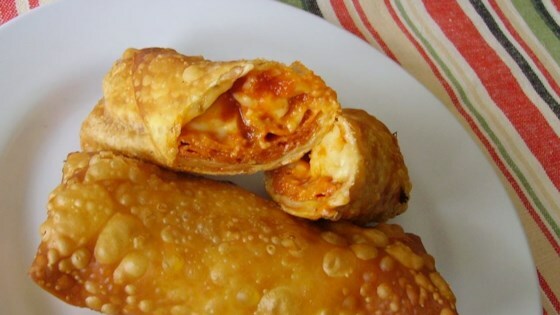 Deep fry pizza rolls in batches until crisp and golden brown, 5-9 minutes. Crispy fries loaded with zesty toppings! These turned out even better than I expected them to. I used my own homemade pizza sauce and made ours with our own favorite pizza toppings. They were DELICIOUS!! !